Brisbane, March 24, 2014 (Alochonaa): East Timor is a deeply Catholic society. Under the years of Indonesian occupation (1974-1999), East Timorese were subjected to gross human rights violations. On November 12 every year, Timorese mothers carry photos of their children down to the esplanade to commemorate the Santa Cruz massacre where at least 250 people were brutally killed. In a country stricken by poverty, and emerging from a genocidal occupation by Indonesia, Timorese parents take solace in the knowledge that their children are experiencing a better afterlife. It is difficult to reconcile this experience of religion with those proffered by the New Atheist movement. It seems as if there is a general requirement among the young and eager for an enemy; nemesis; “other”. Nowhere is this clearer, broadly, or in my own experience, than in the seductive appeal of the New Atheist movement. I have the unfortunate admission to make that I was a devout atheist, complete with all the trimmings: very loud ignorance; significant proselytizing creds; and a very fundamentalist and textual understanding of theology. Having emerged from my Dark Ages, I am unfortunately left with the intellectual hangover from the preceding years. To be clear: I’m still an atheist, I’m just not stupid about it. I can’t help but feel that my former comrades, like I, were suffering an identity crisis which needed some kind of fixed and stable enemy. In the years post 9-11, there is plenty of reason to abhor fundamentalism in all its forms. In this context, religion can fill the void as a symbolic nemesis. There are probably other equally good and non-exclusive explanations for this, but the point is, that the New Atheist reasoning for its own anti-religious fanaticism is probably wrong. Take for instance the regularity with which Creationists or religious fundamentalists are ridiculed on social media in Australia (take a quick look through your feed and you’re bound to find examples). Is this really an issue in Australia? Unlike the United States, those who believe the earth is 6000 years old don’t hold significant political capital, and they’re generally not invited to the big kids table. 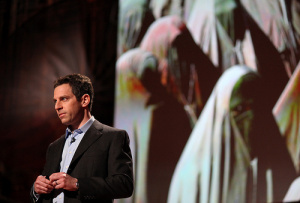 Sam Harris is guilty on many occasions of using religious fundamentalism as a basis for ill-conceived policy conclusions. Source: Flickr. Granted, debates about new curriculum and the detestable revelations about clergy conduct are of grave concern, but these should be targeted accordingly on a case-by-case basis. The debate becomes obfuscated and ultimately unproductive when necessary distinctions are not made between conservatism in Australia, and creationism in the United States. So it begs the question why people feel the need to rally against an invisible force? It’s because New Atheism is intimately connected to, and constituted by, fundamentalism. The movement loses its currency and relevance when moderate, pluralistic and open religion is up for discussion. When the debate is had on these terms, acts such as stoning, female circumcision and under-age marriage become irrelevant. In order to sustain the argument, moderates and fundamentalists are effectively placed under the same banner. Sam Harris goes as far as suggesting that religious moderation should be likened to a virus that enables and perpetuates religious fundamentalism. Without giving this perspective any more credence than it deserves, Harris provides little empirical support for this audacious claim. The recognition that moderate religion is largely benign dramatically reduces the inertia of anti-religious arguments. Therefore New Atheists require believers do what Robert Downey Jr terms going “full-retard”: stoning, bombing and all the associated bells and whistles. One way the movement muddies the water is through the use of emotive language which implies the immediacy of the problem to your most fundamental rights. Terms such as “totalitarian” or “celestial dictator” are used to describe all religious experiences of god; presumably analogous to those in Timor Leste. Framing religious experience in these terms allows for a simple dichotomy: either believers only have their beliefs because they are under threat of eternal damnation, or they are simply delusional and in rapture to a ridiculous leader and belief system. My prediction is that this is unlikely to ameliorate the fabricated anxieties most New Atheists have tied themselves up with. The problem is that this nihilistic idealism is not self-aware enough to realize how ill-informed it is. It doesn’t understand the significance of theology to contemporary ideologies and civilization the same underlying sociological and psychological principles which explain religious, atheistic and ideological fundamentalism, nor does it base its arguments in any kind of empirical research. I can attest to the fact that this kind of ignorance manages to insulate itself from reason all too well. A friend of mine has since told me his method of dealing with me when I went Rambo…”I wasn’t too worried. I just let you go until you wore yourself out”. Well now I’m pooped.